I love this photo taken of us with the Coovers. Here Byron and I had the opportunity to personally thank the Coovers for their generousity for paying for our airfare and accommodations on top of the already generous prize money. We so appreciated the opportunity to go to San Diego and to take in this event. It was life-altering. And to think I almost didn't even make it to San Diego. This photo represents a happy ending to a very tumultuous start. The little known behind the scenes events prior to this week. One month earlier the phone rings. The callers tell me I have won First place for the Women's Age 50+ for the Isagenix Isabody Challenge. I was speechless. It all sounded so exciting. And then, after I hung up .... reality set in. Recovering from being agoraphobic (fear of being in public places) panic attacks, anxiety attacks, debilitating obsessive compulsive behaviour and all the rest of it, I was thinking how am I going to manage airports, airplanes, people, large numbers of people, cameras, hotels and staying away from home. This whole thing was loaded with potential "triggers" for me. It was a veritable landmine of triggers. Crying. Upset. Anxiety going through the roof, I told my husband I am not going. Emphatically. Not going. Less than 24 hours later . I wasn't feeling so great. This progresses to pain so intense I was writhing on the floor delirious with pain. Sick. sick. sick. I thought I was having a really bad anxiety attack. Finally... ambulance... hospital and emergency surgery for a gangrenous gallbladder. Yep gangrene. I was given very strict instructions. I am not allowed to do anything for 6 weeks. NOTHING. 6 weeks! And the trip was in less than 4 weeks. I am thinking people have gall bladder surgery all the time, what's this 6 weeks business. (Well, apparently when things get to the point of gangrene, that involves trickier surgery, a longer hospital stay and a longer recovery time.) RATS!! Meanwhile, my husband, inspired by what he has read about the upcoming celebration event in San Diego, has declared he really wants to go. Me, I 'm thinking ... nope. Not going to happen. So now, not only am I recovering from surgery, but things start to percolate within, and I am being triggered on many different levels regarding previous trauma that occurred in my past, resulting in counseling sessions and other appointments. I was working through some BIG issues. In fact one issue was my deepest issue with my worst shame. It was huge. But here's the thing. I worked through it. It was such a relief to finally deal with it. A huge burden was lifted. Prize money aside, I am forever grateful for winning this trip to San Diego for the enormous healing opportunity this provided me to face my stuff and move forward. It was extraordinary. You can't put a dollar amount on that kind of healing. It is priceless. And here I thought I started Isagenix just to lose weight. Who knew. P.S. It wasn't until only a few days before I was supposed to leave that I actually thought, okay I can do this, I am going. (Byron almost went on his own.) And am I ever glad I did what I needed to do to get myself through what I needed to work through, to get myself there. I was so outside my comfort zone. It was truly a case of feel the fear and do it anyhow. And I did it. Thank you! Thank you! Thank you! In 2006 a former neighbour reappeared in my life. I started to get flashbacks of previous trauma that occurred in their house. Prior to this, these memories were completely removed from my conscious memory. I had no idea, not a clue, that any of this stuff had happened to me. The flashbacks triggered a nervous breakdown. In 2007 I was diagnosed with: complex Post Traumatic Stress Disorder; Severe Depression; Obsessive Compulsive Disorder; and Panic Attack/Anxiety Disorder. I shockingly gained 90 pounds and ballooned to 230 pounds. I was unhealthy. Unfit. Obese. I became agoraphobic ("abnormal fear of being in a helpless embarrassing, or inescapable situation characterized esp. by avoidance of open or public places.") I didn't leave the house. To leave the house I was prone to anxiety attacks and at times full-blown panic attacks. I started to stutter. I could barely function. I became suicidal. I was declared "an invalid" by one specialist and given a lousy prognosis. Mentally and physically I was plummeting, FAST. Metaphorically speaking, I became catatonic. In my pj's, unkempt, I would just sit and stare out the window all day long. Other days I would sit and cry. Everything was beyond what I could do. My parents came up to my place 3 times a week to do my dishes. I could just not function. At my worst, my life was chunked down to 12 hour segments. My goal ..... to be alive in 12 hours. That's it. To heck with anything else like brushing my teeth, or combing my hair. My life was.... just be alive in 12 hours. Take the next breath and breathe. Just imagine what that must be like to be in that kind of despair, and the enormous impact on all of us. I cannot even begin to explain the magnitude of the darkness and stress. My children, are the reason I am alive. As much as I was contemplating suicide, I kept thinking how crappy that would be for my kids to live the rest of their lives knowing their mom had committed suicide. So I took my next breath. A pivotal moment. In one doctor's report I was declared "an invalid". I told my husband I have 2 incredible kids, an amazing husband, and a life to live. I refuse to accept that for myself. I vowed to overcome. August 2011. 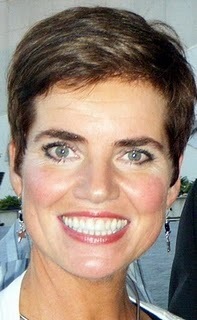 Isagenix "Celebration" 2011. If ever there was a week that was life altering, this was it. Being the First Place Winner for the Women's Age 50 + category, in the Isabody Challenge, I won $5,000 as well as airfare and accommodations for 2 to San Diego for their annual conference. It was unbelievably amazing. I would highly recommend the Isabody Challenge for those who want to tranform their bodies and win some great prizes for their efforts. The Isabody Challenge is a way for Isagenix to acknowledge participants for their results and successes. The grand prize is $120,000!!!! How great is that?!! My first day in San Diego as the Women's Age 50+ first place winner, sitting here with the make-up artist (who was absolutely delightful) prior to our photo shoots. All the 1st, 2nd and 3rd place winners started first thing in the morning with a reception and rehearsal. A fast paced, full schedule followed with make-up artists, photo shoots, numerous outfit changes, judging, more interviews, more make-up, and video shoots. It was really exciting. Marina and Eric Coover, son of Kathy and Jim Coover, co-founders of Isagenix. Eric was a great host for the Celebration event. Funny and personable on stage. Everyone loved him. Here we are. The lovebirds. Byron looked so amazingly handsome in his tux. Marina, Rick Despain, Vice President of Field Development for Isagenix, and his lovely wife at the "Super Heroes" party. "Superhero" he was when he introduced me to Sarah Rodriguez, Vice President of Childhelp, and the result is I was able to set up a Canadian Chapter for Childhelp. I will be raising awareness and funds for this truly worthy cause by cycling across Canada in the summer of 2012 with my family and road team. Movie Stars?!?! Celebrities in our own way. Arlene, Marina, Siv, Meaghan, Kelly and Kari-Lyn. The Happy Couple. Marina and her wonderful husband, Byron. I have to tell you, Byron is the most amazing man. Without him, I would not be where I am at today. He is also one of my "superheroes". Byron, Jimmy Smith, Marina at the gala. Jimmy is the top income earner with Isagenix. He was a butcher. As I understand it, got injured at work. Looked for another job. Started Isagenix and is an amazing success story and inspiration. My story is about overcoming adversity. By sharing it I wish to make a difference for others who may have experienced something similar. I am an avid cyclist, mental health champion, mother, wife, creative gardener, outdoor enthusiast and Isagenix success story. I am recovering from mental illness. I am creating goals for thriving, not just surviving. Prior to Isagenix it took over 2 years to reduce 9 pounds. Then I started Isagenix. Incredible results. The weight literally was melting off my body. Unbelievable. In the first 12 days I shed 12 pounds. From October 2010 to March 25, 2011 … reduced 47.25 inches and 48.5 pounds. 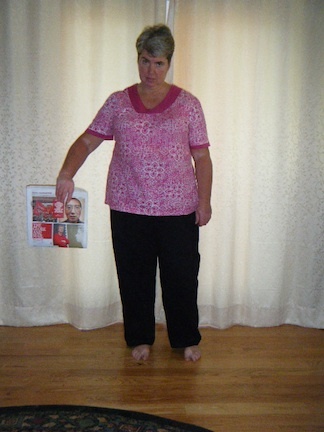 June 2011… 60 pounds and 63.75 inches. 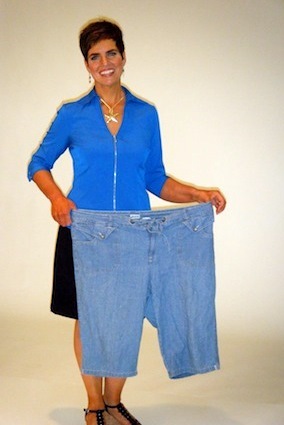 As of Sept 2011 I have shed 78 pounds with Isagenix. Isagenix has changed my life. 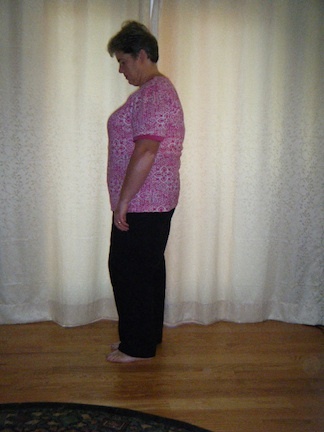 Through serious illness I gained 90 pounds and ballooned to 230 pounds. Physically and mentally I plummeted. At one point I was declared an “invalid” by one specialist and given a lousy prognosis. I could barely function. For years, my husband had to do everything. Cook. Clean. Shop. Carpool. Parent. Work full time. Cameras, flashes, picture taking would set off anxiety attacks/panic attacks. So pictures of me during this time are rare. A pivotal moment, was when my daughter, reluctantly and timidly told me (only because I pried) that she was embarrassed by my weight. I wept. Meanwhile, her prom was nearing. My goal … to have prom day photos with my daughter. Photos to be proud of. I had serious work to do. 1/. 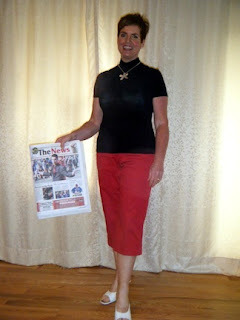 To be able to have my picture taken in public and to not panic (lots of ‘brain training’ and trauma counseling needed). 2/. Reduce my size, so my daughter could be proud. On June 4, 2011, I was able to have prom photos taken with my daughter. It was a great day. I wept… with joy. I went from being unfit; unhealthy; obese; in extreme discomfort; plagued with many health concerns to being healthy, fit, slim, and virtually discomfort free. I am a completely different person. Isagenix is a HUGE part of that transformation. Where I once could barely walk around the block, now I cycle 110 kms/day regularly. My goal is to win the Isabody challenge and use some of the earnings towards a bike trek across Canada in 2012 to increase awareness about the stigmas around mental health issues as well as bring awareness to Childhelp (an organization that helps abused and neglected children). This will be my wildest dream come true, to make a difference for others and to cycle across Canada. This would not have been possible a few years ago. I feel great. I look great. People tell me I “glow”. My confidence is building. My self-esteem is growing. Thank you Isagenix!! Click here to learn more about Isagenix.